We are a coalition of Women and Transwomen who believe in and are working together towards the abolition of gender. We believe Women and Transwomen can live in harmony whilst recognizing we are similar, yet different. We recognize that the violence facing Women and Transwomen alike is real and frightening. We further recognise that this violence is overwhelmingly perpetrated by Males. The Gender Apostates site is a tool to give voice to the ignored, the bullied, and the banned. We will publish works by the members of the coalition as well as others who wish to write about the issues which impact the lives of Women, Transwomen, or those that intersect the two. We aspire to build a community of people who are willing to work towards the shared goal of gender abolition. Any room for pro-feminist, gender nonconforming, gender critical men who also believe in the radical feminist ideal of gender abolition? Great blog, great idea, BTW. Watching with interest. Able, if you want to write about what men can do in support of gender abolition, we can take a look and see if it is appropriate for the site. Not quite sure how we’re going to handle submissions from people we don’t already know, but we’ll look into it. men need their own group. This group is for women. You are trying to come into women’s space- a form of abuse and oppression- exactly what women are fighting against. This group is for anyone who genuinely wants to abolish gendered socialization and is willing to put in the work (because men who expect women to abolish gender on their behalf are simply exploiting the gender hierarchy). Hello, There’s no date on this. How old is this site? How long have you been around? Elizabeth, the site launched in June. Thanks for reading! I find your side very mindexpanding, thank you! What can a transwoman, single parent, do to support the idea of gender abolition? I am having these conversations with my children almost every day. I find the younger generation is way more open and understanding to these changes, then in my times. I have posted my own experience on “children and parenting”, but it was not published…. Thanks Sass and thanks to all at this blog. Liberation from gender bias. What an uphill climb. And I marched in the 60s. Much has gotten worse so a place of understanding and knowledge sharing is testament to your courage. I was just directed to an amazing article on this blog, “Radical Feminism and Intellectual Consistency” and I must say this is what I have been looking for! Thank you and I look forward to reading more. Glad to hear it. There is always room in this dialog for people who reject both ladybrain AND manbrain. I support the abolition of gender- gender does hurt. However transwomen are not women and so I cannot support the use of this word to describe them- they are men. 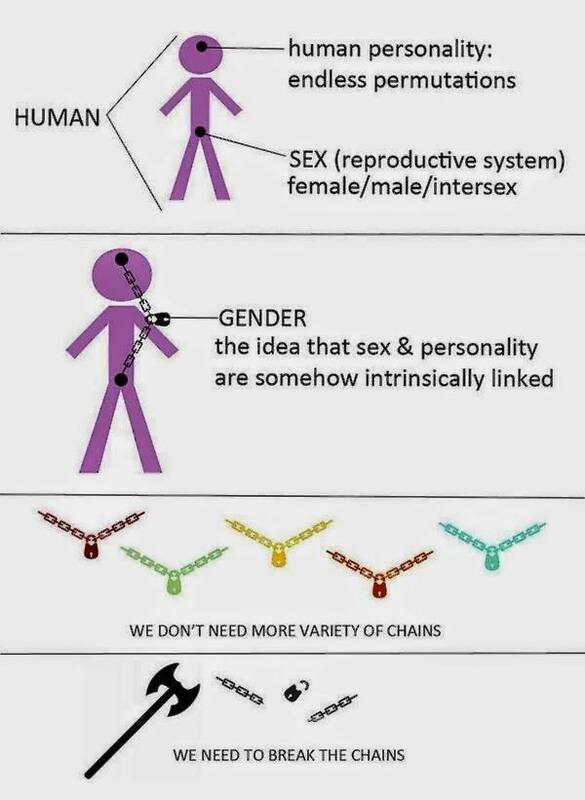 they should be called trans men, and FTM transgender people should be called trans women. These names are more accurate and less oppressive to women. This may be so, and I often use the term “transsexual males” myself, but we use language to communicate, and using terms to use the opposite of their commonly understood meaning only leads to confusion, which is already a huge problem in these conversations. I support the abolition of all kind of discrimination. To tell others who they are is discrimantory in itself. But we can always look into ourselves and figure out who we are, but never others, and we can live accordingly. I wouldn’t want to be part of so much negativity. Let other people live their own life. As long they don’t hurt others and are not abusive I am totally ok with however they identify. I have raised 3 boys on my own. When my youngest was 9 ~ 10 he said to me I feel I am a girl. I asked a friend of mine, who has a daughter, if she may give give us some of her daughters outgrown dresses. My, then girl, lived and tried to find out her identity, and was very happy during that time. When she was 14, she had all her girls clothes nicely folded and said to me:” mom, I have found myself I am a boy, and from now on I will live as a boy.” My, now son, is now all happy with a very nice girlfriend, and they love each other very dearly. It is a pleasure to see them together. Change has to come from the heart, and with an open mind, never by force or oppression. I do not agree with your statement. Trans (sexual) men are not women! That is discriminatory! To call Trans (sexual) men women, is negating transmen identity. Trans (sexual) men identify with men, and want to be perceived as men and associated with men. To do otherwise is literally throwing them in front of a train. Transmen have an easier time being perceived as men as soon taking hormones, looking manlier, then most manly man, but having surgery is a bit more complicated. On the other hand, transwomen, have a harder time being perceived as women, but their surgery is less complicated. Trans (sexual) women are not men, they identify with women, and want to be perceived as women and associated with women. Nevertheless, it is not about perception, it is about identity. What you are talking about is Trans*gender; I know there is a lot of confusion on terminology. I am not too much into labeling myself. However, there are people who call themselves Trans*whatever, please, let us try not to get it all mixed up, it is not helping the issue. It is important to keep an open heart and an open mind to move forward in a constructive manner. However, your statement made me think about Trans (sexual) women again. Therefore, while I have to say that if Trans (sexual) men are men, despite in cases not having ~ the equipment associated with what the general population would perceive as men, I must grant the same to Trans (sexual) women. However, I do not feel comfortable for any men just invading women’s only spaces, if not especially invited. Women have the right to feel secure and comfortable in their own environment. There are rights and there are responsibilities for all, which everyone must respect. she was outside smoking one cigarette after another, just to come in every once in while to order me for more coffee. I realized there are big differences, I did not see before. Not for one moment was she in any way concerned about my kids, or helping to make dinner, setting the table or being involved in any possible productive way. When dinner was ready, she only made remarks she will eat whenever she wants to eat, and behaved quite rude. Just to be blatant I felt, I had gotten myself involved with some stupid d**k, not with a women, as I had seen her before! There are millions and millions of people in this world and we are all very different, some are nice and some are not, some know how to behave and some do not. Nevertheless, I was amazed how much love and what an array of emotion I had been capable of, but because I had decided to drop the victim role, I kicked her out. Thanks goddess! Thank you for maintaining this blog. We need to do more and fight conservative aspects of trans ideology. I know a masculine young woman whose parents didn’t know what to ‘do with her’ and, with the intervention of trans activist friends, she has now transitioned to being a transman. I feel terribly guilty for not intervening or speaking up more. I’m a gender non-conforming woman and I know how hard it is to be different than the other girls. To be confused when everyone is is ohhing and ahhing over clothes, to be called ugly and mannish, to have no refuge and no hope of ever fitting in. Somehow I didn’t manage to get through to her that’s it’s okay, there’s no right way to be a woman. The problem is these social norms, not you, not your body. It’s too late now for her, but maybe not for other people. Keep speaking up! It matters.